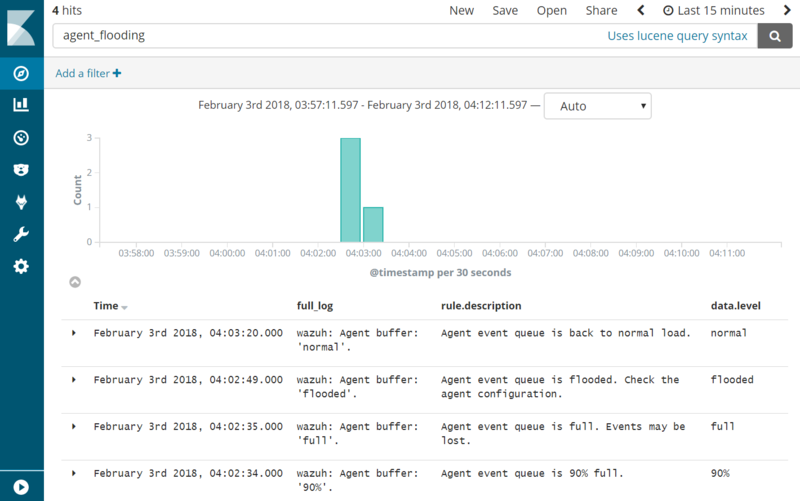 If you see this error in kibana on an agent. It could be for a number of reasons. Follow this process to figure it out. Agent buffer on the client is full, which is caused by flood of alerts. The agents have a buffer size to keep resources on the clients consistent and minimal. If this fills up then kibana will stop collecting data. Logs can stop generating if elastic-search partition reaches 85% full and put the manager into read only mode. 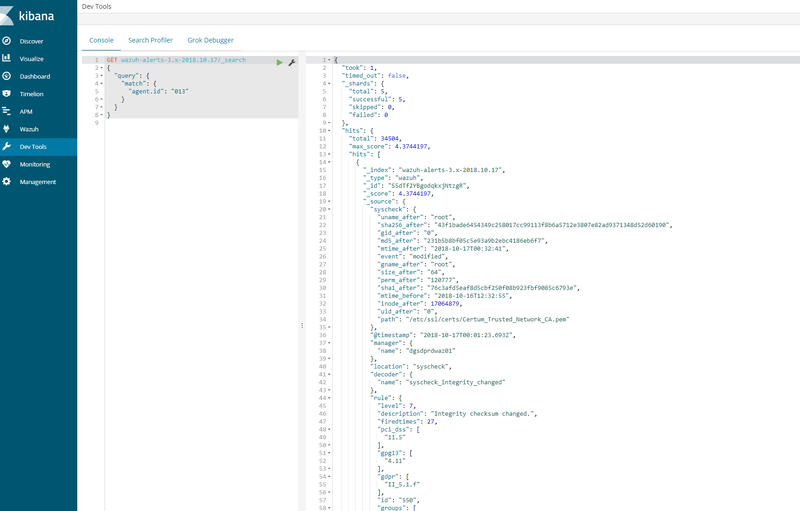 Ones you have ensure there is adequate space you will need to execute a command in kibana to get it working again. 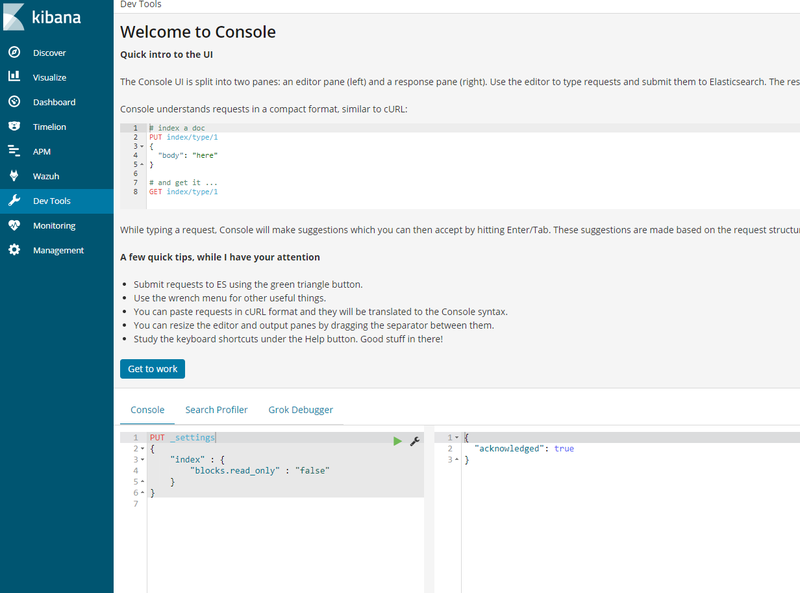 In kibana, go to dev tools and put the above code and play the code. Alternative command that does the same thing. Oct 18 12:25:53 waz01env: Completed. Oct 18 12:25:53 waz01systemd: Started Wazuh manager. If any of these are failed restart them. # systemctl stop logstash…# systemctl stop filebeat (this should not be installed on a stand alone setup as it causes performance issues. 5. Restart Logstash & run the curl command to ensure its not readonly. 1. Check last 10 alerts generated in your Wazuh manager. Also, check the field timestamp, we must take care about the timestamp. …2. 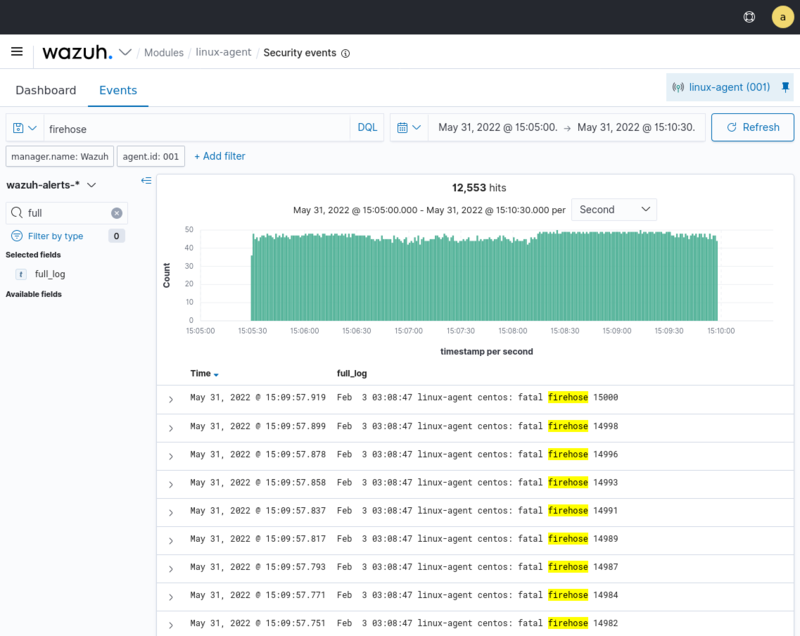 If the Wazuh manager is generating alerts from your view (step 1), then let’s check if Logstash is reading our alerts. You should see two processes: java for Logstash and ossec-ana from Wazuh. alerts in that section of Kibana itself. If there are alerts from today in the Discover section. Reason 4: Agent buffer is full due to flood events. 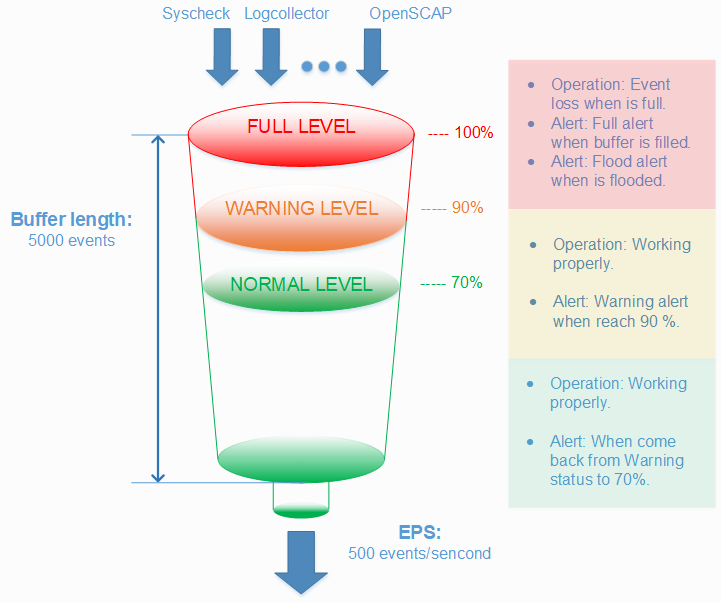 If this occurs events are not logged and data is lost. We want to drill down on a specific agent to figure out what is causing the issue. This should provide a log an output to show that the agent is logged in the indices for that day. If this is successful then we know that the logs are coming and kibana is able to communicate. It should show you a positive number, and that number is the number of lines in the audit.log file. Note down it. 2018/10/17 13:36:03 ossec–syscheckd: INFO: Ending syscheck scan (forwarding database). If you still see the agent buffer full after these steps then we need to do debugging. 2018/10/17 00:09:08 ossec-agentd: WARNING: Agent buffer at 90 %. 2018/10/17 00:09:08 ossec-agentd: WARNING: Agent buffer is full: Events may be lost. 2018/10/17 12:10:20 ossec-agentd: WARNING: Agent buffer at 90 %. 2018/10/17 12:10:20 ossec-agentd: WARNING: Agent buffer is full: Events may be lost. 2018/10/17 14:25:20 ossec-logcollector: ERROR: (1103): Could not open file ‘/var/log/messages’ due to [(2)-(No such file or directory)]. 2018/10/17 14:25:20 ossec-logcollector: ERROR: (1103): Could not open file ‘/var/log/secure’ due to [(2)-(No such file or directory)]. 2018/10/17 14:26:08 ossec-agentd: WARNING: Agent buffer at 90 %. 2018/10/17 14:26:08 ossec-agentd: WARNING: Agent buffer is full: Events may be lost. 2018/10/17 14:28:18 ossec-logcollector: ERROR: (1103): Could not open file ‘/var/log/messages’ due to [(2)-(No such file or directory)]. 2018/10/17 14:28:18 ossec-logcollector: ERROR: (1103): Could not open file ‘/var/log/secure’ due to [(2)-(No such file or directory)]. 2018/10/17 14:29:06 ossec-agentd: WARNING: Agent buffer at 90 %. 2018/10/17 14:29:06 ossec-agentd: WARNING: Agent buffer is full: Events may be lost. 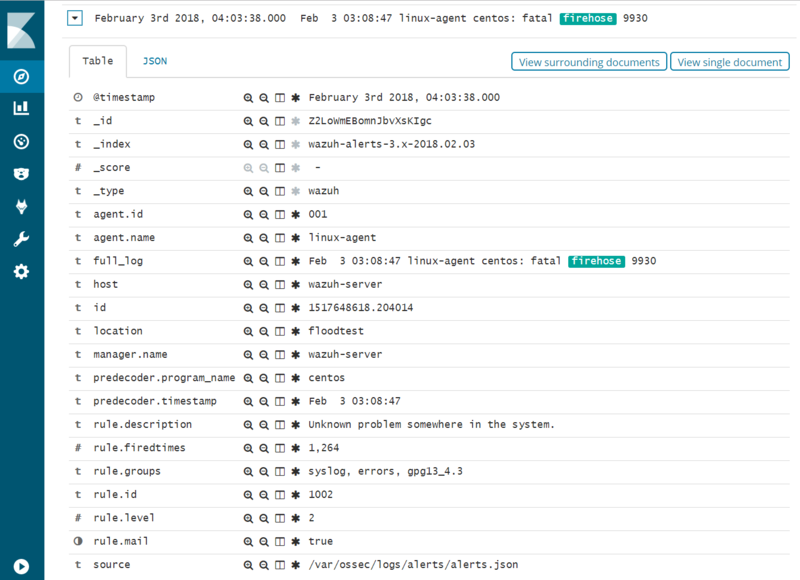 Ok, let’s debug your agent events using logall_json in the Wazuh manager instance. Login using SSH into the Wazuh manager instance and edit the ossec.conf file. 5. Now we can take a look into events in order to clarify what is flooding the agent “013”. Once you have the log is seen, you can disable logall_json and restart the Wazuh manager. 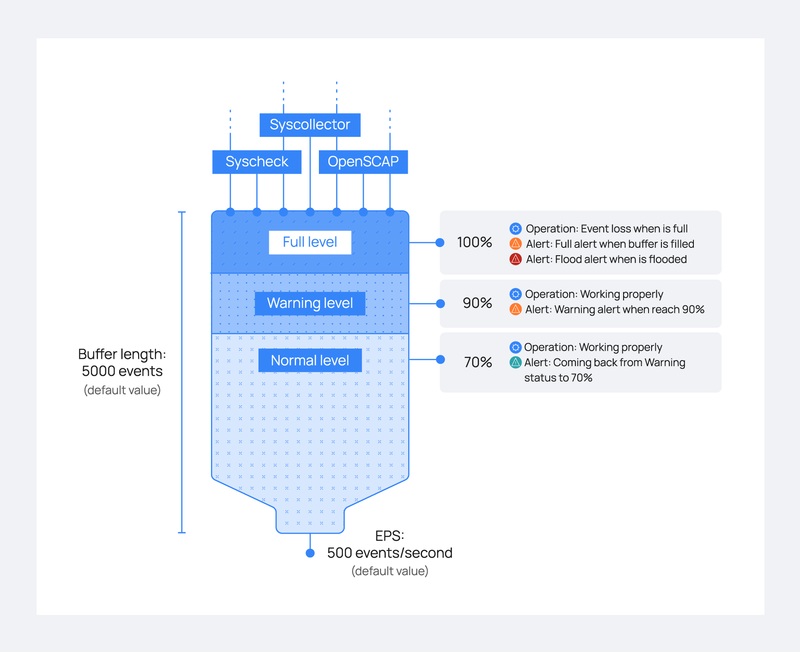 From the above log we can see that kubernetes is sending a lot of events to the agent causing the buffer to fill up. To solve this we particular issue from happening in future. We can disable this at the client level or the global level. 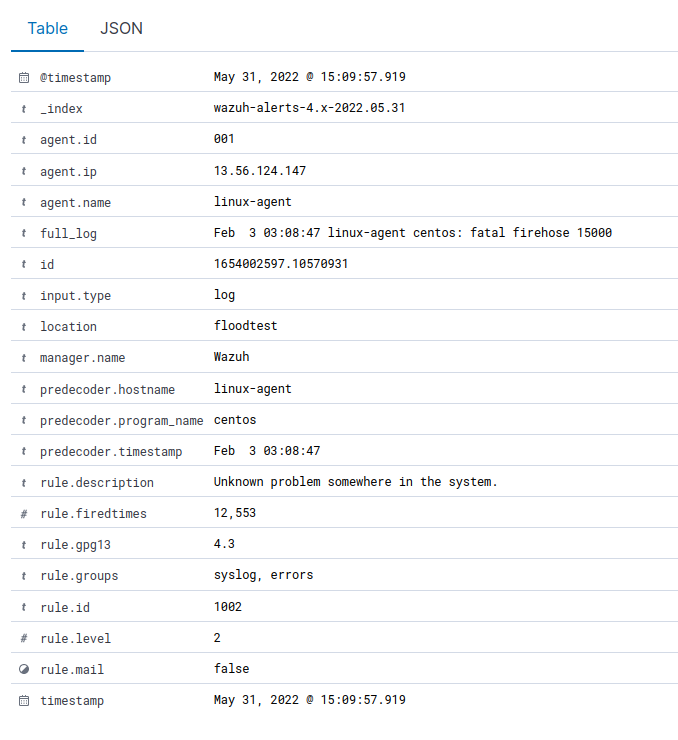 – Login using SSH into the Wazuh agent “013” instance. – Edit the file /var/ossec/etc/ossec.conf, and look for the rootcheck block, then put a <ignore> block for that directory. Option 2. Check in which group is your agent and edit its centralized configuration. – Login using SSH into the Wazuh manager instance. The solution #1 takes effect immediately. it auto restarts itself automatically and then it applies the new configuration. It could take a bit more time than solution #1. The above link talks about how to prevent from being flooded. Now the agent should show correctly in the 15min time range. If a bunch of client had the issue then you need to use ansible to send out a agent restart on all clients or setup a cron on all the machines to restart the agent every 24 hours. Ansible adhoc command or playbook. The first step to setting up Wazuh is to add the Wazuh repository to your server. If you want to download the wazuh-manager package directly, or check the compatible versions, click here. Python >= 2.7 is required in order to run the Wazuh API. It is installed by default or included in the official repositories in most Linux distributions. 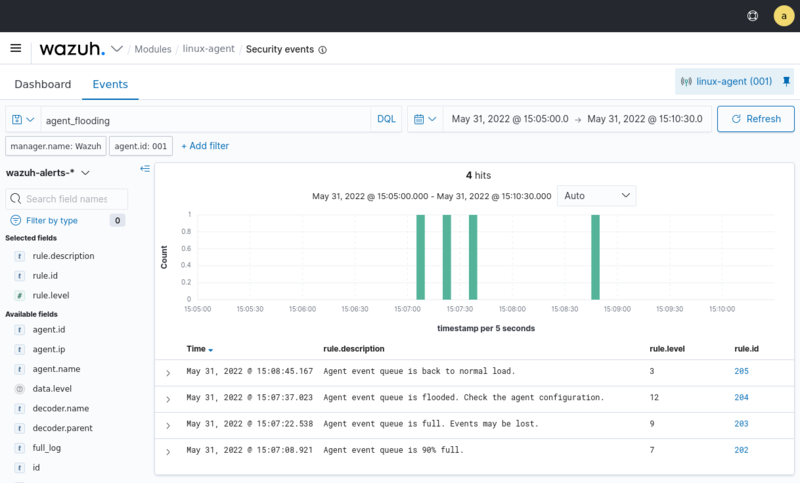 Filebeat is the tool on the Wazuh server that securely forwards alerts and archived events to the Logstash service on the Elastic Stack server(s). The RPM package is suitable for installation on Red Hat, CentOS and other modern RPM-based systems. This guide describes the installation of an Elastic Stack server comprised of Logstash, Elasticsearch, and Kibana. We will illustrate package-based installations of these components. You can also install them from binary tarballs, however, this is not preferred or supported under Wazuh documentation. 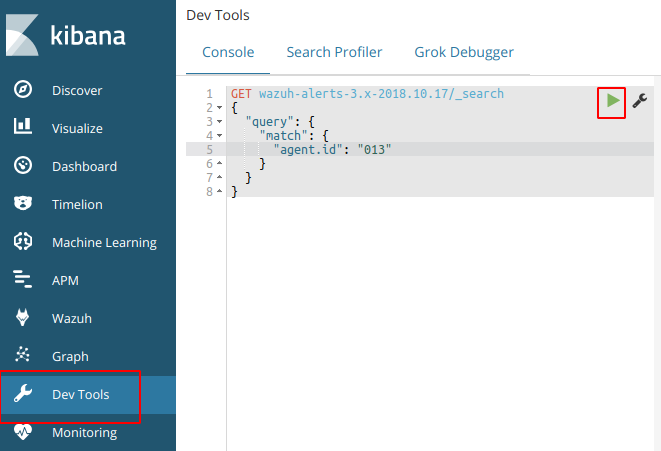 In addition to Elastic Stack components, you will also find the instructions to install and configure the Wazuh app (deployed as a Kibana plugin). Edit the file /etc/logstash/startup.options changing line 30 from LS_GROUP=logstashto LS_GROUP=ossec. If you want to download a different Wazuh app plugin for another version of Wazuh or Elastic Stack, check the table available at GitHub and use the appropriate installation command. 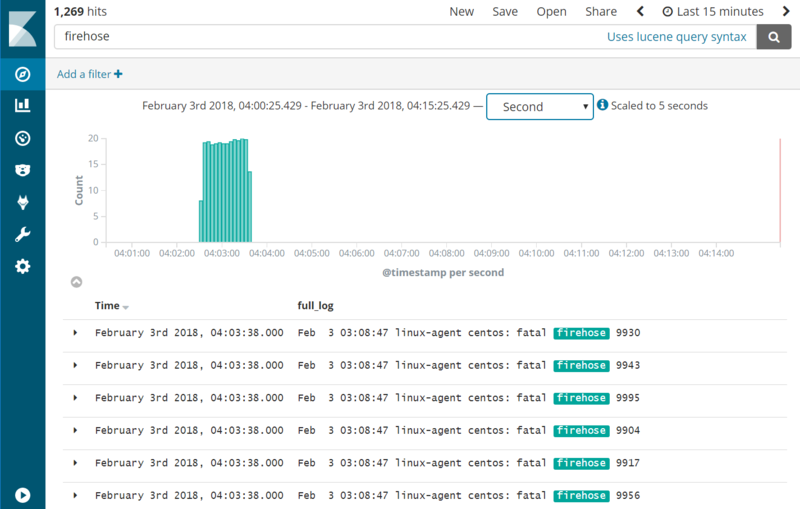 By default, the communications between the Wazuh Kibana App and the Wazuh API are not encrypted. You should take the following actions to secure the Wazuh API. In order to enable HTTPS you need to generate or provide a certificate. You can learn how to generate your own certificate or generate it automatically using the script /var/ossec/api/scripts/configure_api.sh. In case you do not need to acces to the API externally, you should bind the API to localhost using the option config.host placed in the configuration file /var/ossec/api/configuration/config.js.